Two of my favorite rosewood-scented products, SABÃO PAU ROSA, Brasil (a soap) and Bois de Rose Eau de Toilette, "disappeared" about 10 years ago. I can't remember the names of their manufacturers, but I remember their fragrances and have been searching for replacements ever since. The rosewood soaps were bright-red glycerin ovals wrapped in lime-green paper with black-and-white lettering. Bois de Rose was made in Provence and came in pale pink boxes decorated with an old-fashioned drawing of a rosewood tree. I did 'repay' Susan for her intense scrutiny of my unsightly legs. As we wandered through the scalding Ghost Ranch landscape, dotted with scary signs warning of "Plague" and "Hantavirus," I looked at Susan's (usually) pale skin and literally saw RED (she was so flushed, I screamed — "Your SKIN...is on FIRE!") Susan ran indoors in a panic to find a mirror and to buy an icy can of Fanta soda to hold against her crimson face. The sun was strong that day: it bleached not only my hair (turning it from light brown to blonde on top) but the shoulders of my turquoise-colored shirt. Bois de Rose blended well with the sun and heat, and the aromas of New Mexico — roasting chilies, wood smoke and fragrant chaparral. 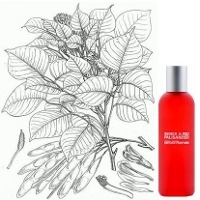 I was excited when Comme des Garçons introduced its own rosewood fragrance — Series 2, Red: Palisander; it contains Brazilian rosewood (palisander or Dalbergia nigra), Virginia cedar, saffron, myrrh, red chili and pepper. The opening notes of Palisander are rosewood-y: I smell rich, raw wood, the sweetness of fruit (chili/Capsicum? ), saffron and a hint of turpentine. In mid-development, Palisander mellows as warm cedar notes come to the fore. Palisander's base notes smell of warm chili pepper, benzoin, myrrh and residual saffron, and these notes produce a pleasant talc-y accord. Palisander smells great and "natural" (though its 'palisander' is surely either synthetic or recreated with a mixture of other notes), but Palisander doesn't replace Bois de Rose (or SABÃO PAU ROSA) — nothing ever smells quite like the discontinued fragrances we knew and loved. Brazilian rosewood, due to the beauty and strength of its wood, not to mention its fragrance, has been over-harvested and is now endangered and protected in Brazil, but you can still find examples of Dalbergia to sniff, especially Honduras rosewood (Dalbergia stevensonii), in fine wood shops that cater to sculptors and makers of musical instruments and furniture. Show some enthusiasm, and the shop owner or assistant might be persuaded to lightly sand a section of the rosewood to bring out its delicious fragrance. I used the final drops from my last bottle of Bois de Rose in New Mexico. Bois de Rose smelled like Brazilian rosewood: exotic, cool and warm (camphoric), resinous, woody (of course) but also a tad fruity-floral (with tart red berry/rose hip and rose petal notes). Bois de Rose: Requiescat in pace. Palisander was created by perfumers Yann Vasnier and Françoise Caron, and is $102 for 100 ml Eau de Toilette. For buying information, see the listing for Comme des Garçons under Perfume Houses. Please comment if you can recommend a rosewood-rich perfume or soap! Image via Wikimedia Commons of Dalbergia sissoo, D. Brandis, Illustrations of the Forest Flora of North-West and Central India, 1874. Last fall, I ordered samples of Palisander and Harissa. I remember not being impressed…. but I don’t remember with which one. I will have to revisit those samples tonight! Plat14: I like the entire Red series (though I don’t wear “carnation” very often). Ah, Kevin. I love CdG Palisander and I love New Mexico (where I have not been in almost ten years!). I think Palisander or L’Air du Desert would be great choices for a trip there. I don’t get chili from this scent, but it is so sweet and woody. There is something a tad synthetic to my nose, but I don’t mind, and it does get deliciously powdery. I’m lucky enough to have a big bottle of this and it’s great. I also need to dig out my sample of Ava Luxe Palisander to compare (I’m generally a fan of her line). I still need to try Harissa & Sequoia from the Red series. Thanks for this review — so nice to see this scent getting some love and PR! Joe: write me and tell me how Ava Luxe Palisander stacks up against CdG. If you’ve ever roasted chiles (or charred them over flame and peeled off the skins) I bet you would recognize that scent in the extreme dry-down of CdG Palisander. K, I’ll definitely let you know. Also, you may want to google Lothantique + Bois de Rose to see if that’s the product you remember. Joe: unfortunately, it wasn’t Lothantique…if ever I hear the name again I’ll recognize it, but I have the feeling the company went out of business. And I bet my soap disappeared because it became illegal to harvest rosewood in Brazil in the early 90s,,,and that soap used REAL rosewood. Reporting back after side-by-side of CdG and AL: The AL is much sharper on the opening, very cedary or “fresh wood” as opposed to “aged wood”; it calms down and becomes a bit smoother but there remains a somewhat lemony overtone to it, though lemon isn’t listed in the notes. CdG is certainly much creamier and soft, and I like the sawdust or pencil shaving aspect I get. Try as I might, I still don’t detect any roasted pepper (like in Piment Brulant). Something in CdG feels like heliotropin, but I like it. I planned yesterday to throw the AL sample in your package, but I discovered there were only about 3 drops left when I got home last night! Great post, Kevin! To the smells of New Mexico I’d have to add burning flesh as I’ve roasted thru shirts as well out there. And had misadventures with self-tanners — I go orange! I’ve wanted to try CdG for a while; this will get me going. Suzanne: CdG is a great line to explore. I’ve gotten to the point that I’d rather look weathered like Georgia O’Keeffe than streaked and orange with self-tanners! well, notice that I sit in the shade, despite my glamorous outfit! …and you are naturally tan! HA! Great review, Kevin — I am keen to try this. I love rosewood and the aroma of roasting chilis. Ducks, hope you enjoy it! I owned a bottle of this last year, and loved it, but always felt that there was something in it that irritated me in the base note. I finally figured out that it was the saffron and sold my bottle. I must admit, though, the rosewood note is just perfect. Smells like the inside nooks and crannies of a handmade acoustic guitar. I have had diificult times with Harissa (wore it once when I was sick – ruined it for me thereafter) and Sequoia (it smells WAY better on other people) but I can’t wait to own Rose. The raspberry / rose combo is magical! Mike: I haven’t tried the CdG Rose (hadn’t actually heard of it!) but if you like an interesting berry/rose, try PdN Balkis. I’d be curious to know what you think of it. Joe/Mike: butting in…but PdN Balkis is to CdG Rose as a bowl of ice cream with hot sauce, whipped cream and candied nuts is to a scoop of sorbet! HA! The PdN is DEFINITELY a heavy dessert! If CdG is the “diet jello” version of that, it could be great though. Mike, forgot about the Rose…that one is nice and sparkly in the best way. Ooh, I’ll have to try the rose, especially if it is a “diet” version of Balkis. I LOVE Balkis, but this sounds nice also. The only one of the Red series I have tried is the Carnation, which is on my wish list for a FB. Now I know to look for Palisander. krokodil…and thankfully samples aren’t hard to come by. Have you tried the entire Red series? Are they all good? Is Palisander the best? Does that mean you loved Black Aoud and thus nothing can compare, or that you hated it beyond belief? I confess it’s a fave of mine. krok: I like all the Reds, even Carnation *but I don’t wear carnation scents very often. The light, bright, cool rose of Red Series is NOTHING like the roses in Montales. CdG Rose is very lively. then is there something like Palisander is that ~*~*better*~*~? Have you tried anything from the incense series? CdG Zagorsk is fantastic. From the red series—I have the Carnation…it’s a beautiful very spicy carnation…but probably a little “floral” for you. I’ll always remember when you said you most often felt ~*~fierce~*~ and florals don’t say fierce to me. krok: I don’t understand the question! HA! I’ve only Paestum Rose… and didn’t like it. I’ll try Bois d’Ombrie and Baume du Doge. When I saw this review I rushed to find my sample (thanks to the equally ineffable Joe) so that I could sniff my arm while reading all the comments. Palisander smells like the inside of our piano (which is NOT rosewood) so it must be the resinous quality of wood I’m getting a nose full of. It stays piano-ish for about half an hour then that synthetic note that Mike mentioned starts to emerge…after about an hour I can only think of my husband playing baseball and basketball—because he wraps his ankles with atheletic tape. The piano association was fine but the athletic tape shut the door on this one for me. My compliments Kevin, on another wonderful review. I adore the stories from your travels…and now I can add “my soap–it’s BROWN” to ” I’d like some the du Mont!” as well as a variety of fun phrases from the “slop-pot-pourri” post that I enjoy cackling over on occasion. Thank you Daisy. And I think the ‘synthetic’ note you and Joe mention in the dry-down is really the red chili (it comes on strong as the cedar goes away). Only if red chilis smell like Spaulding Atheletic tape…But I have never smelled the roasting red chilis so it’s entirely possible. Kevin—you may want to have a go at making your own rosewood soap—Snowdrift farm sells Brazilian plantation grown rosewood essential oil…and they have soap recipes as well. Daisy! I have enough hobbies as it is! HA! It’s almost canning season: an obsession…. oops sorry, don’t even think about soaps…..what are you canning? Daisy: it’s marmalade season…do tons of different chutneys in summer…grape jam, strawberry jam, preserved cherries in syrup…the list goes on and on…. PS I have roasted NM green chile stashed in my freezer. My sister-in-law and I mule it back here on the plane in its own, full suitcase or cooler, taped shut. There’s nothing like it, is there? I’m not the only addict out there. $170 delivered Fed X? No problem. March, I have a friend who has family in NM. She is known to bring back frozen chile but she has *never* shared! Maybe I’ll beg next time. I can provide you with some simple recipes! Or you can just leg it back out there and let them do the cooking…. lord, I miss that food. I ate green chile enchiladas, etc. last July until my stomach begged for mercy. March: YOWZA! We always get New Mexican chiles up here in Seattle at Whole Foods in the summer…but I understand the craving…love the smell, the taste, that HEAT. Wonderful story and a lovely review, thanks Kevin. I prefer Palisander in the middle and dry down. My weirdo nose gets whiffs of synthetic upon first sprays. Of the red series like Sequoia too. C: Palisander is my fav. of the Red too…but thankfully get no synthetic vibe! wow, can CdG do anything wrong? in the red series I tried sequoia so far: needless to say it was instant love. Can Bertrand Duchaufour ever do wrong? I just admire his work so much. Palisander is now on my to try list (even if it is not signed BD!). Linking to the bottle post of few days ago, I would just complain about the CDG series bottles…A bit plain for my tastes…but who cares when the juice is stunning? Isn’t that still sold as the “Leaves” series? Boy there are a lot of CdGs. The only green one I’ve sampled is Lily. Joe, yes, but I think the Leaves series was cancelled. Great review, Kevin. I quite like CdG Palisander (and rosewood in general). As I recall, there’s also an interesting milkiness (almost a bit cheeziness) to this one that I find very interesting (the way sandalwood can also smell a bit like buttermilk). Joe: you really must try CdG Sequoia — it’s my favourite of the Red series, and is grand, powerful, and resinous. There is something in there that reminds me a little bit of Amouage Jubilation XXV (also by Duchaufour). jtcomboy: Sequoia is a bit “rougher” than Palisander, isn’t it? A nice contrast…. Kevin, Sequoia reminds me A LOT of 10 Corso Como. I love them both, and sometimes wear one on each wrist to try to discern what are for me, subtle differences between them. Some days I can’t tell them apart at all. I can’t recall if you like 10 Corso Como or not. Exist: I loved CC when it came out…I ordered some samples recently and (is it a new sandalwood-less version?) it seems so different from what I remember! I’ll have to find a bottle to try in a store…. I know the brasilian soap that you are tolking about. I work in the company that make this soap. The name of the soap is Phebo. Juliana: yes…it was Phebo. That rosewood soap is no longer to be found…at least here in the States. I hope at some time in the future, DURING MY LIFETIME!, rosewood can be safely harvested again. I miss that soap. Kevin, I hardly dare to ask, but since you like rosewood… have you tried Voluspa’s Brumese Rosewood? I haven’t tried it, but I do like the Baltic Amber. Platinum: yes, I’ve tried it the moment it came out. There’s a great rosewood/tropical timber note as it opens but then it becomes too vanilic for my tastes. If the top notes would last I’d buy it.